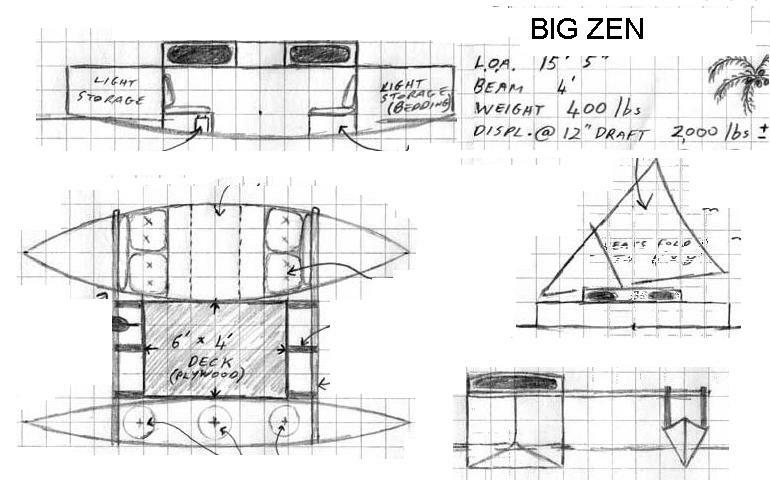 So lets do a hypothetical, lets do a design for a stretched Big Zen proa, a bigger more capable boat. Now at this point we have a more capable boat, with a simpler rig, at only a modest increase in overall weight and cost. So how does it stand. The two obvious downsides are (1) the complicated dual rudder set-up, (2) and the rig which keeps the center of effort aft of the ideal position. Yes we could add jibs at each end, but then the complexity starts to add up, having four sails instead of two. So lets try and simplify the craft overall without increasing its dimensions. If we make the craft a tacking craft, instead of shunting, we only need one rudder, and we can apply a much simpler rig. I think the original craft had the outrigger to windward (as a counterweight) though I am not certain. The outrigger is also large in volume, so it could work very well to leeward, as a float without modification. Now if the craft is to tack not shunt, there is no requirement that the craft be symmetrical fore and aft. So we can move the cabin back a little to a place that will have less motion. Additionally we can deepen the forefoot a little for better wave piercing. The result is shown below. 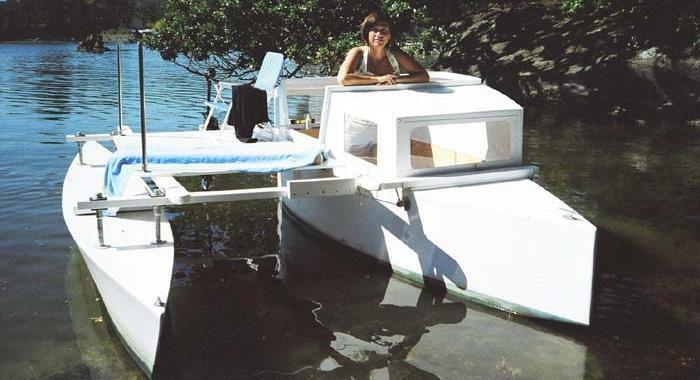 This craft has a lot of potential as a low cost, simple fun family cruiser. The size is small, keeping weight and costs down. The rig is simple and low cost. It should point to windward reasonably well but use of a 4hp outboard would be used a lot of the time. The outrigger needs some weight to give the craft stability. For simplicity sake this may as well be left inside for the duration of the trip.